Contrary to popular belief, there�s much more to making a good photograph than pushing a button on a good camera. While there are many cases when automatic settings or presets can serve the purpose, there are times when you need to take control of the camera and make it collect the data specific to your needs. This post follows a similar theme to my last one, in that it explains some of the things I consider before I take a shot rather than just giving the settings used. 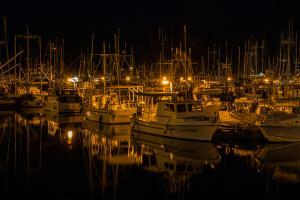 For this purpose, I�ve chosen �Night At The Marina�, a shot I took on a hot summer night in September. I hadn�t really done much in the way of night photography so this one gave me a few challenges I needed to consider. Focus - Autofocus isn�t an option when you�re photographing at night, and it can be difficult to manually focus by looking through the viewfinder. Because I wanted good detail around the boats, I decided on aperture of f/18 to get a good depth of field, knowing it would give me the added bonus of a star effect on the lights. Exposure � Back to basics on this one. The exposure triangle is made up of aperture, shutter speed and ISO. I already knew I was going with an aperture of f/18 and ISO-100 is my preference whenever I can use it. That left shutter speed. By using a tripod and a cable release, I was able to take camera shake out of the equation. That left subject movement. Conditions were extremely still, so I didn�t need to worry about the boats moving, unless someone happened to be on one of the boats (fortunately that wasn�t the case). With night photography, you also need to consider earth rotation if the sky is to be part of the image. The position of celestial bodies such as the moon and stars actually change fairly quickly. In this case, the sky wasn�t part of the photo, so I wasn�t limited there either. Now I�m just looking for the shutter speed I need to expose to the level I desire. Cameras will only meter to 30 seconds, so longer exposures can be another test. With the camera on bulb setting, you control the shutter speed by depressing the shutter for the desired amount of time. There are 2 methods of determining the desired shutter speed�experience and trial and error. In my case, I didn�t have the experience to draw from, so I turned to trial and error. For my first attempt, I chose 2 minutes. I knew that if the result was too dark, I would adjust to 2.5 or 3 minutes to brighten it up. If it was too bright, I would go to 1 or 1.5 minutes. I got lucky with 2 minutes, so I didn�t need to go through multiple attempts. Composition cannot be forgotten. I won�t dwell on the basic rules of composition, as we�ve all heard them many times before. One thing I will mention is that through experience with blue hour shots at this location, there can be some very bright reflections from the downward facing lights. I wasn�t able to avoid all of them, but by careful positioning, I was able to avoid the worst one by having it blocked by the AE Viking. It�s a matter of working with angles, and with a little movement to the side or vertical adjustment on the tripod, you can really improve the final results. As mentioned in my post from last week, this is just an example of some of the things we think about before pushing the shutter. If you consider your subject and know what you want in your image, understanding the cause and effect of each of your camera settings can help you tackle some of the more difficult situations. What time was this taken? Sometimes the information is included in the write-up about the image, but I�ve come to the conclusion people are just there for the pictures and don�t read the details. Unfortunately, those people probably aren�t reading this either, so I�m not sure I�ll be any further ahead in the long run. The problem with questions like the ones listed above, is they only apply to the conditions at the time the photo was taken. Similar shots in the future may use the same settings, but more likely, they will need some tweaking to get the desired image. Rather than spoon-feed actual settings, I would rather have people understand how to get there with the myriad of resources we have at our fingertips. While I have a good enough understanding of the concepts to adjust settings for my needs, I still like to do a bit of homework to determine a starting point to save me some time and effort. How do I photograph _____________? Fill in the blank with whatever you�re planning to shoot. You�d be surprised by the amount of information out there and the best part is you�ll find many different approaches instead of a single, biased opinion. One example that comes to mind is photographing the aurora borealis. There are technical questions that can be answered regarding the process of actually taking the photograph, but there�s additional information that should also be considered. To start, you have to determine if there is an aurora to be seen. I googled �Aurora Forecast� to find some helpful sites that try to predict aurora activity. The problem with that is although I monitor 4 or 5 different sites, they�re for Alaska, Yukon, Northwest Territories, or Edmonton. It�s a bit of a stretch to make those predictions mean something for us here on the island, but they�re better than nothing. Another thing to think about is �What does the Aurora Borealis look like?� I�ve been out a few times this year and come away with some nice, colourful photos. I�ve also shown the differences between what I see and what the camera captures. I won�t go into details here, but there are many resources out there that explain it very well. It all comes down to rods and cones and light intensity and all that good stuff. The good news is that many of the explanations you�ll find will be in easy to understand language. They make science easy. Another major concern is �What�s the weather going to be like?� There�s not much point in planning an aurora shoot if there are clouds in the way�kind of like photographing a full moon. To be more specific, given the aurora, if active, will appear to the north or northeast of us on Vancouver Island, clear skies above or in any other direction won�t be a big help. The best tool for answering that question is a map and a compass (or iPhone app if you�re so inclined). Finally, the aurora borealis is very unpredictable. It can appear suddenly and disappear just as fast. Like anything else, it�s a matter of monitoring conditions, and being in the right place at the right time�oh, and a good bit of luck. One last bit of advice, understand the basics of proper exposure. You may need to make adjustments between shots, and you can brighten or darken images using various combinations of aperture, shutter speed and ISO. There�s no right or wrong answer, but knowing the desired effects regarding depth of field, motion and image quality will dictate which approach to take. This is just one subject, but the processes are the same for all. Get to know your subject before you try to capture it, and you�ll have better success. First off, I�d like to apologize for the �vote solicitations� for the National TV Contest. This is not something I feel comfortable with and judging by the loss of a few FB followers today, it�s not popular with people in general. That said, this contest is huge, and vote solicitation is encouraged. As mentioned on the contest home page, there are hundreds of thousands of photographers eligible and each one can submit up to 3 photos. To be conservative, let�s go with 100,000 photographers at 3 photos each, for a total of 300,000 submissions. It would make sense they�d want artists who have a large following and/or the ability to promote to the masses�hence the high threshold of 250 votes needed to get to the final stage. Given that post effectiveness tends to deteriorate over time, let�s cut that number by a third to get a conservative estimate of votes to people reached. Based on those numbers, I need to get my post seen by 15,000 people in order to get to 250 votes. Considering I currently have approximately 1,400 followers, this is going to be a real challenge. What does this mean? It means I need a lot of help. Any help you can provide, whether it be voting, sharing my FB post, commenting on the FB post (brings it back to the top of the newsfeed), etc. would be greatly appreciated. Lastly, I ask that you bear with me. This is a promotion campaign that will last for a couple of weeks, and it will be over. I�ll still be doing my regular posts during this time, but I am going to do what I can to try and get at least one photo into the finals. Over the last while, I�ve noticed people navigating to the blog page on my website. Unfortunately, there�s been nothing there for them to see. Anyway, this is my attempt at starting to put something in writing to go with my photography. I�ll treat this first one as a bit of an introduction, explaining who I am and what I do. If all goes well, I may try to post more on a bi-weekly or monthly schedule. We�ll see how it goes. 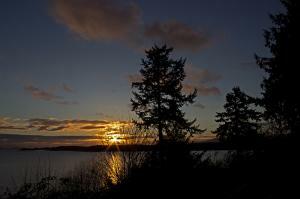 I�m a self-taught, landscape/nature photographer residing in Parksville, on central Vancouver Island. We live in a natural paradise that allows me to capture most of my images within half an hour or so from home. It�s only been the last 3-5 years that I started taking photography more seriously and started my business 2 years ago. I started showing my work at Island Exposures Gallery, thanks to my friend and fellow photographer, Craig Carmichael. Then came the summer markets and art shows that are so popular in this area. I really enjoyed that part of it, as it gave me an opportunity to meet people, talk about my work and get direct feedback. Between those shows and my online presence through Facebook, I felt that I was starting to get my name and my work out there. Last year I moved into a new gallery in Parksville (Oceanside Village Artists� Gallery). We had a bit of a slow start, as it took people a while to find us, but once they did, things started to gain momentum. I just recently moved out of that gallery and now have my work on display at Pacific Shores Resort and Spa. They�re also selling my work through their gift shop. Another line that I started up this spring was teaching. I tested the waters with a few evening workshops, designed for beginner to intermediate photographers. Through my own experiences, I thought it would be best to keep class sizes small and subject matter focused. By concentrating on specific themes like sunsets or flowing water, the students were finding the amount of information manageable and seemed to enjoy the experience. I�m looking forward to a productive 2015. 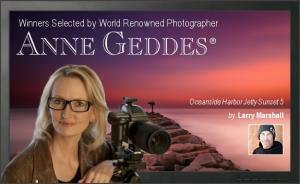 I will be setting up a schedule of workshops, both for the general public and for guests of Pacific Shores Resort. I will also be looking into various markets and shows throughout the year, so if you�re in the area, stop in and say hello. Next up� About My Work.